As usual, I’ve been rummaging through stacks of new Government publications to find inspiration for this blog. Today, Discoveries from EOS Aura caught my eye. 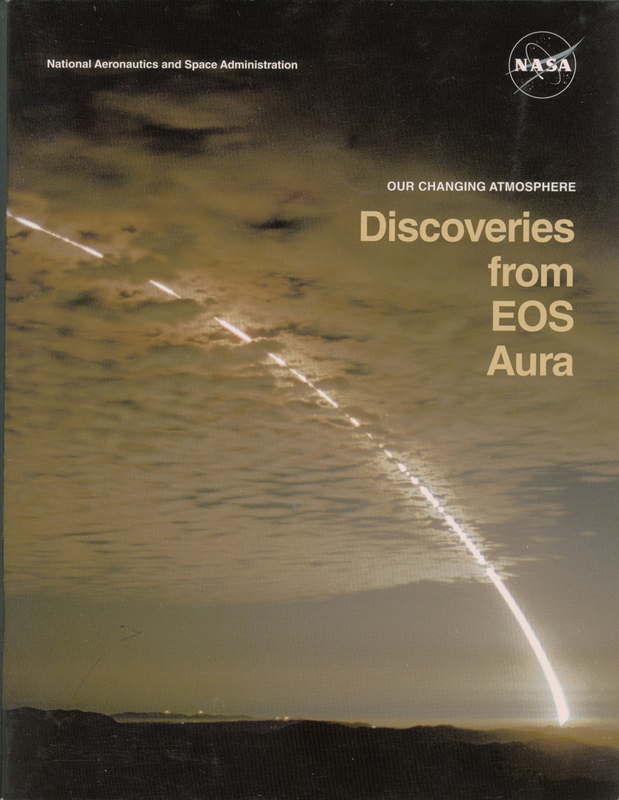 It’s a colorful booklet about the Aura satellite, which is part of the National Aeronautics and Space Administration (NASA) Earth Observing System (EOS) program. I confess that I was a bit hesitant when I turned to the first page and saw a list of such things as the High Resolution Dynamics Limb Sounder (HIRDLS) and the Ozone Monitoring Instrument (OMI). I’m not a technophobe, but all of that sounded out of my league! I shouldn’t have worried, though. Discoveries from EOS Aura is accessible to the layperson and touches upon a lot of the significant scientific and environmental issues of the past few decades. The Aura satellite uses HIRDLS, OMI, and two other instruments to measure levels of ozone, aerosols, and key gases throughout the atmosphere, and this publication features highlights from the past five years of research. One highlight: according to Aura, thanks to the international agreement to ban chlorofluorocarbons (CFC) from use in air conditioners and refrigerators, the notorious ozone hole in the stratosphere is closing due to a decline in the chlorine from CFCs. That means the ozone layer can perform its crucial role of protecting us from solar infrared radiation. Another less positive highlight: Aura data-generated maps show how sulfur and nitrogen dioxides, volatile organic compounds (VOC) like formaldehyde, and other human-generated intruders continue to pollute the air we breathe. Aura’s data are so good that they indicate a lessening of industrial pollution on Sundays over North America and Europe, and Saturdays over Israel. Aura also detected a lessening of pollution over China as a result of that country’s atmospheric cleanup prior to the last Olympics (it’s back up again, unfortunately). I’m always looking for interesting facts in my reading material, and this publication has plenty. Some years ago, there was some discussion of the idea that trees cause air pollution. (I remember seeing a photo of a tree upon which someone had hung a sign that said “Stop me before I kill again”!) The basis of this theory was the emission of isoprene, a VOC that can increase surface (AKA “bad”) ozone, by some species of trees, especially in the Northeastern U.S. Scientists know that trees really do this, although they don’t know exactly why. The key point of the “trees cause air pollution” flap, however, is that without nitrogen oxides from cars, industry, and power plants, surface ozone would be low even when isoprene levels are high. The verdict: not guilty! Discoveries from EOS Aura is just an introduction to the vast amounts of information that this little-known program is generating. On the Aura Web site, you’ll find lots more, including observations of the havoc wrought in the atmosphere by that Icelandic volcano earlier this year. I wasn’t able to find an online version of this booklet (I know some blog readers may regard this as a challenge! ), but you can get a printed copy here.